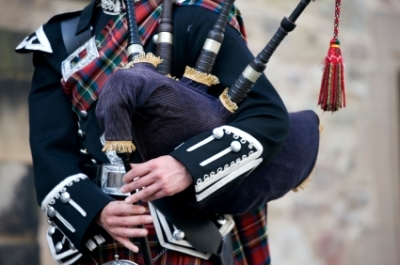 Many people remain, through no fault of their own, under the misapprehension that bagpipes are bagpipes, instruments played by big Scottish men in kilts that create a sound that is one of the most divisive of all musical instruments. In fact there are many different types of bagpipes – with some regional favourites across Great Britain – and among these the Irish bagpipes are one of the most pleasant sounding of all. Irish Bagpipes more properly known as Uilleann pipes, or Uilleann Bagpipes were originally called Union Pipes and are more closely related to smaller pipes such as the Northumbrian smallpipes than they are to the traditional highland bagpipes that are the ones we think of when say the name, and they share a characteristic with their Northumbrian contemporary that distinguishes them from the Scottish pipes. Whereas the traditional full sized bagpipes are played by the piper blowing into a mouthpiece that inflates the bag which gives the pipe its name, this then being gently squeezed to propel the air through the chanter – the part that makes the tunes – Irish bagpipes, and the Northumbrian version, do not have a mouthpiece at all. Instead, Irish bagpipes are powered by bellows, this meaning there is no need for the blowing that is the most difficult part of the Scottish bagpipes, and is considered by many a more efficient method of playing the pipes. Like the Northumbrian pipes Irish bagpipes have a different tone to the Scottish traditional bagpipes, a mellower and less harsh sound that covers two full octaves. This gives them greater range and a completely different result, and they are often used as accompaniment to songs in traditional folk style. It is interesting to note that the original Irish bagpipes of several centuries ago were bigger instruments, very much like – some say identical to – the now familiar highland bagpipes; how, and when, the use of the smaller bellow powered Irish bagpipes came into play is difficult to document, although there are records of them going back many years. With their mellow tones they have become popular not just with folk bands and for traditional Irish songs but also with rock bands as interesting accompaniment; the massive selling Irish group U2 have, for instance, used the Irish bagpipes in recordings on a few occasions, and recordings of traditional Uilleann pipe music are still popular to this day. Like many folk instruments Irish bagpipes show no signs of dying out; players take great pride in continuing the traditions of their forebears – just as players in Scotland do with the highland pipes – and many makers of Irish bagpipes provide high quality instruments for people to play and learn on and keep the sound alive. The haunting sound of the Irish bagpipes – similar to that of the Northumbrian pipes – is one of the most distinctive of all instruments, and quite unlike the standard bagpipe sound that we all know and love – or, in many cases, hate! For more information on Irish bagpipes look to the internet, for these enjoyable, ancient and interesting instruments are a joy to listen to, and to play.